bookcase design software makes modeling big job easier than ever. SketchList 3D — Bookcase design software. Bookcase design software? Apparently SketchList 3D does a fine job with that. There is little I like better than good news from a SketchList 3D user. This one is about using SketchList 3D as bookcase design software. 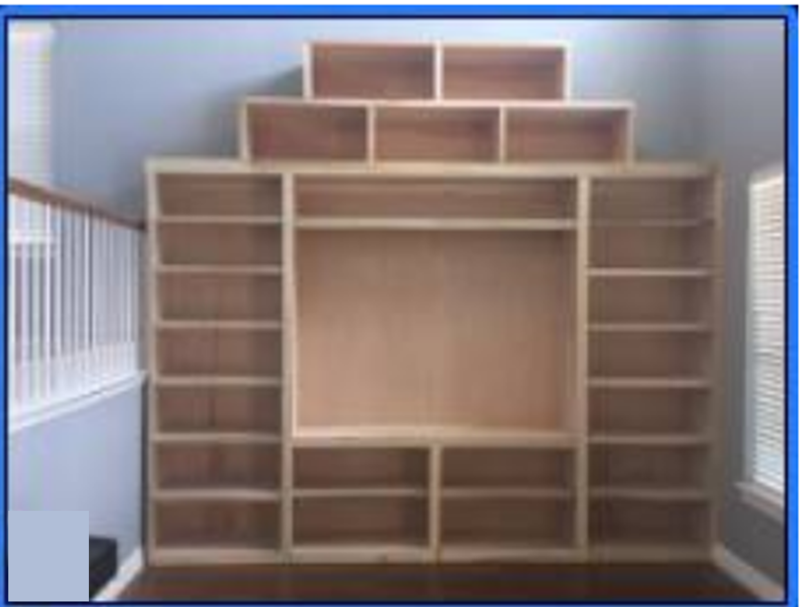 I am attaching a picture of a bookcase that I just completed where I had designed it in SketchList bookcase design software. The first is the completed but unfinished bookcase. This is the first project I have done using SketchList Pro. What a blessing it has been for the design, purchasing the products and the cut sheets. Made the cutting so “easy” and with the two different sizes of plywood used the waste minimal. I have attached the file as well and expect that you could have done it much more efficiently. I expect I will be able to as well as I continue using the program. And while looking at bookcases I found this really cool idea thanks to Mark Dutka of Inhouse Design Studio. Great work Mark! CLICK TO SEE IT.